The Indonesian “Orangutan Conservation Strategy and Action Plan” was launched in 2007 as a ten year program to ensure the survival of orangutans in Indonesian Borneo( Kalimantan ) and Sumatra. The plan was tagged as a way for Indonesia to not only save the orangutans but also to reduce its carbon emissions when orangutan habitats are protected. ​*In the last 35 years about 50,000 orangutans are estimated to have been lost as their habitats shrank. If this continues, this majestic creature will likely face extinction by 2050…The fate of the orangutan is a subject that goes to the heart of sustainable forests ... To save the orangutan we have to save the forest, said Indonesian President Susilo Bambang Yudhoyono at the launch of the plan." We are getting close to the end of the ten year plan and a press release issued by the Ministry of Forests and Environment on the “Current Status of Orangutan Population and Habitat” implied there was an increase in orangutan populations. The increase in populations seemed to contradict other predictions in the same report that only 38% of the current population will be viable in the next 100-500 years. I wasn’t sure if I should celebrate the fact that 38% of all orangutans will be alive in 100 years or mourn the disappearance of 62% of their population. Based on my personal information from monitoring forest issues and from talking to local people in Kalimantan and Sumatra, I would have said that the increase in populations is not from healthy orangutan populations but from the discovery of new populations that were not accounted for in the 2004 report. It is never a good feeling to discover new species or populations of wildlife only to find out they are under threat of extinction. 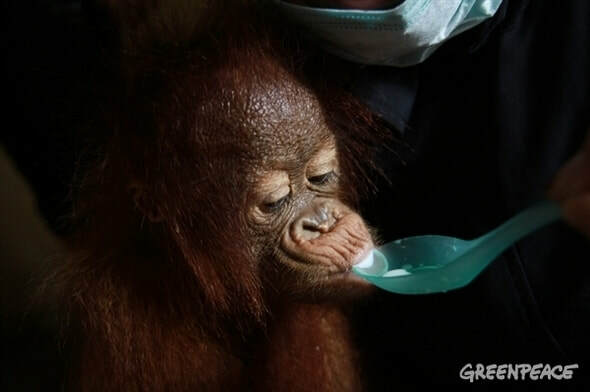 I reached out to Greenpeace Indonesia which has been bluntly critical of Indonesia’s efforts to save the orangutans. In a press release issued on the same day as the Ministry of Forests and Environment, Greenpeace was much clearer on the status of orangutans in Indonesia. The number of orangutans in Indonesia continues to decline. From the latest estimates in the 2016 Indonesian Population and Habitat Viability Assessment (PHVA) report released today, the density of orangutan populations on Bornean land (including Sabah and Sarawak) declined from 0.45 to 0.76 individuals / km2 (PHVA 2004 ) to 0.13-0.47 individuals / km2. It's been over four months since the Ministry of Environment and Forestry publicly announced that MPK must repair the damage it caused by filling in the canal it developed to drain peatland. Now they say that if the company resumes its field operations they will freeze its permits and if the company still doesn't comply then the permits will be revoked. What they don’t say is that MPK has already restarted operations and has not filled in the canal, nor repaired the damage caused. How many warnings can a company ignore before the government acts? The company he is referring to is PT Mohairson Pawan Khatulistiwa, a timber company co-owned by Indonesian and Chinese interests. It has a license to develop timber in Sungai Putri peat dome in West Kalimantan, one of the last remaining habitats for orangutans in a province where palm oil plantations have caused severe habitat loss. Greenpeace Indonesia’s focus on saving the forests in Sungai Putri could well be the litmus test for Indonesia’s will to save its orangutans. One of the efforts is the Ministry of Environment and Forestry is committed to protect the forest areas that become the habitat of orangutans and other protected animals. This is also done in commemorating World Orangutan Day which is commemorated every August 19. If the Indonesian government is serious about protecting orangutan habitats, then the Sungai Putri peat dome must surely qualify for protection! The failed Mega Rice Project in Central Kalimantan should serve as a lesson for what happens when extensive peat land areas are drained for industrial development. In an email response, Arie Rompas, Greenpeace Southeast Asia-Indonesia mentioned the on-going problems with the drained peatlands in Central Kalimantan. In relation to the government's plan to restore the peatlands through the Peat Restoration Agency (BRG), Sebangau National Park area is not a priority because the peatlands are still relatively well maintained, although in the south there are threatening by palm oil companies activities. However, if the recovery success on the ex-mega rice project, especially on the area in Block C which is the boundary of the national park area, I think it will have a good impact on the recovery for peat in the Sebangau National Park area as orangutan habitat. It is important that the government should stop granting permits which open new canals for oil palm plantations and block canals to re-wet the peatlands on this region. The ministry continues to stress that saving the forests will require the participation of communities, civil societies and industries. However, in order to save forests and orangutan habitats the first step that must be taken has to be legislation from the government to give these areas official protection. Only then, can we talk about full participation from communities and civil societies to realize sustainable forests and well preserved biodiversity.